Research shows that simply exposing young girls to women in STEM careers can eliminate stereotypes and encourage girls to think that they too can also have a career in STEM. As you may know, female STEM role models are an essential piece of our SAfG after school programming, with a scheduled visit from at least one female career scientist to a class during every 8­10 week session. This past summer, we set out to push our Role Model Program to the next level, creating a new after school series called “Project Catalyst”. This new program seeks to ignite a passion for science in each SAfG girl through direct experience with the passion of female STEM professionals in every class during the session. This fall, we introduced our newest program theme: “Project Catalyst: Becoming a Biologist”. SAFG reached out to local female biologists in all biological specialty fields to join the project as partners in developing content and delivering instruction for the entire session. These female biologists are recreating some of their first positive science experiences as hands­on activities in our SAfG classrooms. Engaging in real science experiences with career scientists is a crucial component of our SAfG Role Model Program, as it allows students to visualize themselves in these roles in the future. In the Project Catalyst series, we’ve increased these interactions dramatically, doubling down on our commitment to create strong science identities in our participants. Our participants leave SAfG programs knowing what different kinds of scientists do, but our surveys show that many of these girls still do not self­identify in these roles. This program is targeted to close that gap, providing explicit experience in science practices, linking these experiences with the idea that engaging in scientific investigation requires skill and knowledge, and that developing this skill and knowledge is what they are doing every day. We believe that deepening the partnership our girls have with local scientists will be a powerful tool in emphasizing that they are scientists now. With that knowledge, we are excited to see just how far they will go! We plan on continuing this series each year, partnering with more local scientists to develop a variety of program themes including “Project Catalyst: Becoming an Environmental Scientist”, Project Catalyst: Becoming a Computer Scientist”, and more! This partnership with industry is also a great way for companies to support SAFG’s efforts to change the face of science, with the potential to increase the diversity in their own pool of employees in the future, furthering our goal of creating a more gender­equitable society. There is heightened awareness around how the business community's support can have a great impact on education. Increasingly, nonprofit organizations and corporations are teaming up to advocate for social causes, labeled as "collective impact". We seek out these partnerships with industry in our community. If you are interested in participating in a Project Catalyst program, please email us. Some very exciting news, SAFG just received a grant from the Warriors Foundation for a third year in a row! The Warriors Foundation has been one of our biggest supporters, not only with these generous grants but with basketball ticket donations for our girls and families. Thank you so much for supporting girls and boys in STEM in your Oakland Community! Also for a third year, the Clif Bar Family Foundation awarded SAFG a grant to support its Food Science program and Ross Stores Foundation awarded a grant to support its afterschool programs for girls at elementary schools in the East Bay. Thank you to Clif Bar and Ross for supporting SAFG! Since our last newsletter in the Spring, we also received a grant for the second year from the Cisco Foundation to support its classes at Oakland schools. Cisco is a wonderful supporter of STEM programs throughout the Bay Area! For the first year we received a grants from Sandia Laboratories to fully support a robust Family STEAM Night program at six elementary schools this year in Oakland and Emeryville and a grant from Matson to support SAFG’s after school programs in Oakland. Thank you Sandia and Matson! We want to say another big thank you to NOVUS for its continued generous support each year. NOVUS generously donates twice a year to SAFG and has done so for the past three years! 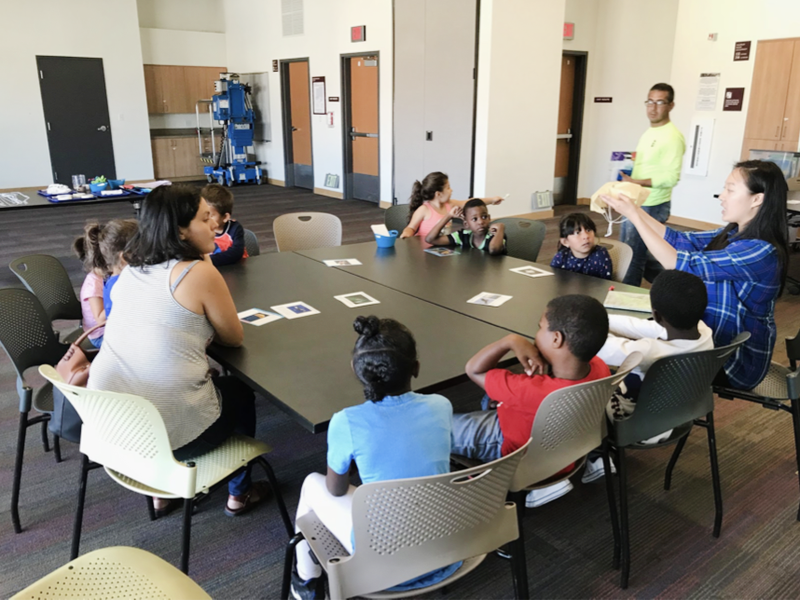 Finally, we want to thank the Nancy P. and Richard K. Robbins Family Foundation again for its continued support during the 2018­2019 school year, not only in supporting after school and school day science classes at Anna Yates Elementary, but also for supporting SAFG scaling and adding program support this year and next. We truly appreciate your vision and support of STEM for everyone! during Giving Tuesday on November 27th! If your company provides small grants to programs like Scientific Adventures for Girls and would like to sponsor a class, please write toccarr@scientificadventures.org – we would love to apply! This fall we have increased our volunteer program exponentially, with over 30 volunteers bringing us to a total of over 150 hours of service. We have been able to double our Near Peer program to get more young people building leadership skills and acting as models for our students. Our volunteers seem to like the program as well, since 94% of them have chosen to volunteer with us more than once this year. This year, we have also been able to build on our Role Model Program. Over 2/3 of our volunteers were role models this year, with ten of them piloting our Partner Biologist Program. In the Partner Biologist Program, biologists and scientists were asked to help develop curriculum and assist with a lesson that resonated with them when they were younger. One biologist, Kaylee, talked to the girls about how she grows yeast cells in a lab, even bringing in a stuffed animal yeast and a real fermentor! When she left she exclaimed that “it was so fun! I definitely want to come in again!”. Scientific Adventures for Girls is kicking off the 2018 fall year with our afterschool program at eight elementary schools in Oakland, Berkeley, and Emeryville. Washington Elementary in Berkeley and Hoover Elementary in Oakland are two new teaching sites for Scientific Adventures for Girls, and we are excited to be running our “Pow Bang Fizz! Science Whiz!” curriculum, a series of popular courses that encourages hands­on, minds­on exploration. At Anna Yates Elementary in Emeryville and Temescal Library in Oakland we rolled out our brand new science curriculum of the session, “Project Catalyst: Becoming a Biologist”. Students have the opportunity to meet a different female scientist role model each week and ask her about her early science “ah­ha” moments, while calling on her experience to hone skills in observation and recording. Outside of our afterschool programming, Scientific Adventures for Girls is at three Oakland public branch libraries: Dimond, Golden Gate, and Melrose Branch Library, for free, drop­in STEM programming for children and families. Finally, Scientific Adventures for Girls will hold six Family STEAM (science, technology, engineering, art, math) Nights in conjunction with local elementary schools. We will be introducing two themes, “Carnival Science” and “Science Olympics”, both of which have been designed to bring scientific engagement and exploration to students and families. “Bay Area Science Festival” this weekend! The challenge: Using a few or all of the materials above, create a fall­safe egg protection device. What are some ways to protect a delicate item? Can you slow the speed of the fall? How can you protect Humpty Dumpty the egg from cracking upon impact? Design your device and test it by dropping it on the ground. Open­ended engineering is one way to remind young scientists that there is not always only one correct method to solving a problem. There is no perfect design or one “right” way of building. Even if your first design is flawed, that means there is a great opportunity for you to go back and redesign!